We got in some new baby chicks in at Acorn Lane Farm this week. Our friend Ellen in Versailles wanted to get some more chickens for her property so we split a shipment of chicks with her, well we got 18, and she got 10. If you have never experienced how they ship chicks, it is quite an amazing thing. They ship day old chicks from the hatchery via US mail in a small box, as in 12” x14” and 28 baby chicks fit in there comfortably! Ellen was getting them up to size and had a great setup in her house. She took a guest bathroom and put the baby chicks in a walk-in glass shower, with the heat lamps and everything. They have grown quickly and Ellen was ready to get them out of the house, because as Hope and I can tell you, they create quite a mess. With our current resident 24 hens and 2 roosters, we raised them in a homemade brooder box in our basement of our old house. The funny thing was our old house was in a subdivision and if the Homeowners Association knew about the chickens, I am sure that they would have freaked out! So Ellen called us and brought our new little guys down the same day. 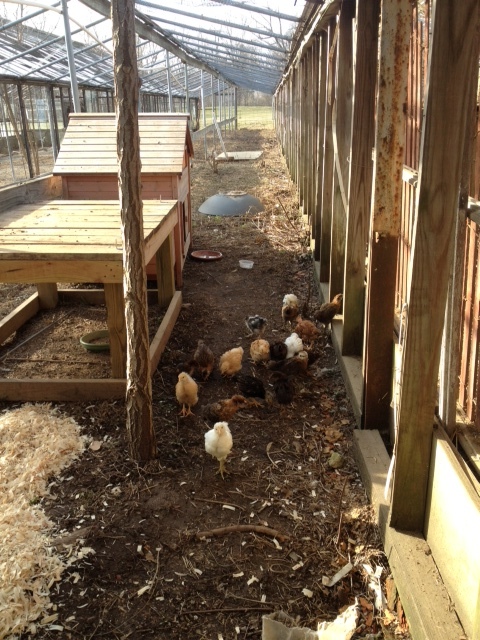 We have a new area for them to roam in but it is a little cold right now for these girls and guys to be out and about. So we have an adorable little wood coop that we set up a heat lamp in and they are staying nice and warm.